The rich, nutty flavor of a good mole is something I’ve strived to recreate for years. Making it from scratch is always better than a store-bought variety, and each time I eat out at an ‘authentic’ Mexican restaurant, I try to dissect the sauce for elements I can recreate at home. El Mirasol in San Antonio makes a FANTASTIC MOLE, as does Guajillo in Northern Virginia. 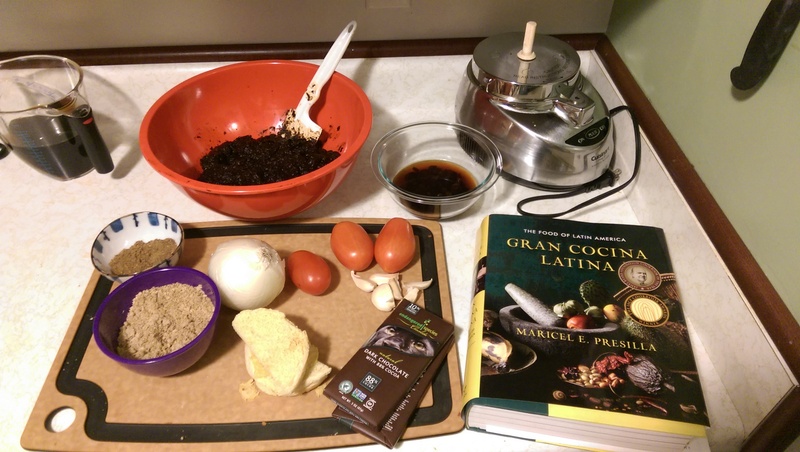 I decided to step it up a notch last Christmas, and bought Gran Cocina Latina, which has FOUR mole recipes and a plethora of tips and suggestions for making the intricate recipe much easier to take on. I started with the “Famous Mole Poblano of Santa Rosa.” The recipe below is from that—but adjusted a little more to my tastes, bumping up the sweetness factor and cutting back on the chiles and fat. What you will end up with is a delicious, earthy paste that can be separated out for multiple uses over a few months—making all the work worth it in the long run. You easily create a mole sauce from the paste by adding in chicken stock, and it works great with chicken or turkey (for a festive holiday meal) but also doubles as an easy enchilada recipe, or a sauce to serve with tamales, tacos, or nachos. When shopping for ingredients, start first with a latin grocery store—I found all the chiles and spices there—whereas Whole Foods only had about half the ingredients at double the price. Preparing the chiles is a long, annoying task—but it can be done up to ONE WEEK ahead of time. Consider breaking this up over two days. This recipe involves cooking a lot of elements separately, and then adding them together at the end. 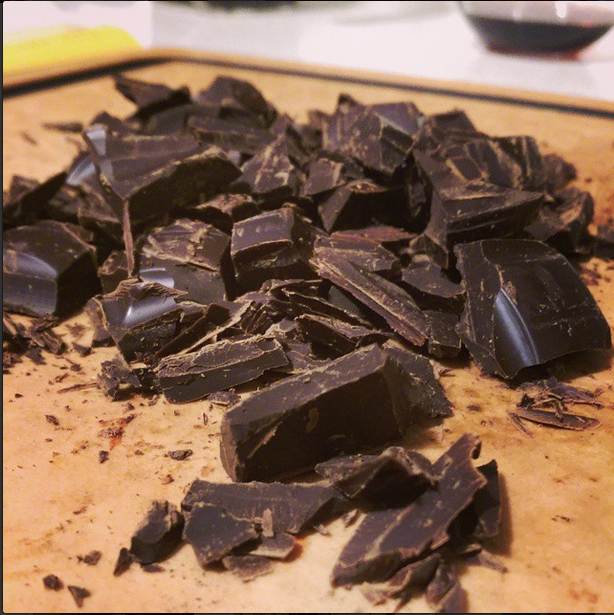 Read the ENTIRE RECIPE from start to finish, and have everything prepared beforehand. You will need a food processor or blender, a cast-iron skillet and a coffee or spice grinder to get through the all-day process. The recipe highly recommended using a Chinois to press the mole paste through at the end (and again once the chicken stock was added) to truly create a silky, smooth texture. I omitted this step below because I prefer a more chunky sauce—and honestly, the paste was too thick to pass through my fine-mesh sieve. PREPARING THE CHILES: Heat a cast-iron skillet over medium heat, until a drop of water evaporates on contact—then reduce the heat to low. Working in batches, add the chiles (in red) and roast, pressing with a spatula, until fragrant (less than 1 minute on each side). Place roasted chiles in a large bowl. Cover chiles in hot water until softened, 20-30 minutes. Drain, reserving 2-3 cups soaking liquid. Stem and seed the softened chiles (USING GLOVES), reserving two tablespoons chile seeds. Place the reserved seeds on the griddle and roast, stirring occasionally until very dark. Set aside. PREPARE FRUIT: Place raisins in a small bowl and cover with 1/2 cup reserved chile liquid. Heat cast-iron skillet to medium-high and add 2 tablespoons olive oil. Add plantain slices and fry until golden brown, turning twice for even cooking. Scoop out with slotted spoon and set aside. ROAST VEGETABLES: Preheat oven to 350 degrees. Place tomato, onion and garlic on pan and roast 20 minutes, turning occasionally, until skins are blackened. Once roasted vegetables have cooled, peel onion and garlic, and remove charred bits of skin from tomato. Set aside. ROAST SPICES: Heat cast-iron skillet to medium heat. Place the spices (in purple) on the skillet and roast until fragrant (2 minutes). Remove at once and grind into a fine powder using a coffee grinder. ROAST NUTS & SEEDS: Roast almonds on griddle until golden (2 minutes), set aside. Roast sesame seeds, stirring constantly, until they start to pop (1 minute). Place almonds, sesame seeds, and reserved chile seeds in a coffee grinder and process to a coarse powder. Set aside. PREPARE THICKENERS: Toast bread and tortilla on skillet until golden on both sides (2 minutes). Set aside. COMBINE INGREDIENTS: Place roasted vegetables in a food processor with the ground spices, nuts & seeds, raisins, fried plantains, and bread thickeners. Process to a fine paste. FRYING THE MOLE: In a large dutch oven, heat lard/olive oil over medium heat until fragrant and pour in chile purée from STEP 3. Simmer, stirring frequently for 20 minutes, or until fat begins to separate from solids and sizzle. Stir in vegetable purée from STEP 9, and cook for 25 minutes, or until fat again begins to separate from solids. You should be able to see the bottom of the pot when you move your spoon. Add sugar chocolate and cook until melted, about 2 minutes. Taste for sweetness, and add more sugar if needed. Season with salt. Move mole paste to blender and process until smooth—repeating the process if needed. Let cool, and separate out into 1 or 2-cup containers. Store in the fridge for up 1 month, or freeze up to 3 months. FINISHING THE MOLE: When you are ready to use the mole, thaw (if frozen) for 1 day and then add to a sauce pan with an equal part chicken stock. Whisk until smooth. Blend again into a smooth sauce with a silky texture.